Blockchain has increasingly been in the news over the past few years and is receiving much hype over its potentially disruptive uses and the various high expectations that users have for this technology. Many experts have compared its development to that of the internet itself and the difficulties it had to overcome before it could be universally adopted. 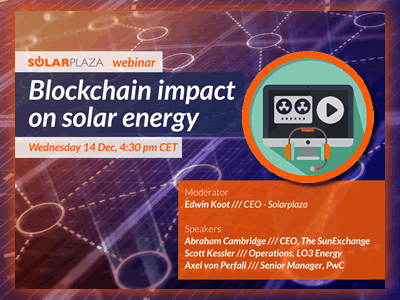 In a webinar we hosted last year on the impact of blockchain on solar energy, Dr. Axel von Perfall, Senior Manager in the Energy & Utilities Team of PwC, claimed that the different applications for blockchain technology are growing rapidly as well as the adaptability of the technology for different industries. According to Dr. Von Perfall, industries experiencing decentralization, such as the energy sector, could be pushed even further with the use of technologies such as blockchain. Blockchain is basically a platform to store and record transactions using a distributed ledger. It is a relatively new technology that is showing promising potential to create new foundations for our economic and social systems. However, it still remains to be seen how long it will take before it can be integrated in our economic and social infrastructures. But first, how does Blockchain work and how would it relate to the energy industry? The next part of this article will discuss the details of how blockchain works, followed by the different uses it has for data sharing and business transactions, and finalized by describing the energy-related uses for blockchain. Blockchain technology lets you share data across organizations in a secure manner; execute transactional services in multiple organizations; and execute smart contracts. All of these different uses allow for business processes that operate outside of the boundaries of an organization to be automated in a secure and decentralized manner. Blockchain offers all parties involved in a business network a synchronized and secure record of transactions. Every sequence of the transactions is recorded from beginning to end in a blockchain ledger. This can be used either to record 100 steps in a supply chain or just a single online payment. As soon as a transaction is finalized, it is put into a block which is connected to the block before and after it. Furthermore, groups of transactions are blocked together with a fingerprint of each block added to the next. This in turn creates an immutable chain. This immutable chain is part of a ledger that is distributed in order for it to work as a shared method of record keeping. This ensures that no individual or organization holds ownership of the system. For example, as a product cycles through its supply chain, it gives permission to everyone involved with the process to access a copy of every record and piece of data related to that product. An important detail to emphasize regarding the use of blockchain is that no transaction can be added to the chain without consensus amongst the participants. This means that any addition or alteration to the blocks is permanently recorded. Not even a system administrator can delete a transaction. By having these safety measures in place, the blockchain is highly secure and is tamper-resistant. Therefore, in theory, this would eliminate the risk of fraud and error. Blockchain is essentially a digital contract that permits individuals the possibility to directly conduct and bill a transaction to another party. The technology was initially developed as a core component of the digital currency bitcoin in 2009, where it contained all of the transactions on a public ledger and facilitated direct transactions between senders and receivers without an intermediary. This method of transactions has inspired a wide variety of different uses in both financial services and non-financial services, as well as for public and/or private use. Recent developments in the financial industry have caused blockchain applications to grow almost on a daily basis. When it comes to financial services, blockchain can be used for the trading of digital securities, cryptocurrencies, foreign exchange, data storage, digital content and peer-to-peer transactions. Currently, smart contract applications and private blockchains are considered to be the most important developments in blockchain technologies. These developments could allow contracts to be captured in codes and from them to be able to execute themselves on the blockchain. The only way that smart contracts can execute themselves is if all users give their approval for the specific transaction. An example: ‘Two investors, Company A and B, want to make a deal that if Company A makes profit by the end of the year, it has to pay 25% of its net income to Company B. The blockchain is then able to check at the end of the year if Company A went bankrupt or not, if any profits were made, and if everything checks out, then the transaction can be automatically processed without the need for an operator’. For non-financial services, some of the uses of blockchain include: protecting the privacy of consumers; providing proof of ownership to authenticate or give autorisations; and creating a safe network infrastructure. An example would be to use blockchain to create virtual IDs for users to log on to social networks using their own identities. The virtual IDs are built using blockchain technology, therefore they are both unforgeable and tamper-proof. Besides those uses for blockchain, there are also public and private blockchains that provide users different benefits. Public blockchains are blockchains where the operator cannot manipulate the data, thereby eliminating the need for a trusted intermediary. This also removes any incentive to charge additional fees. Private blockchains, on the other hand, are controlled by the operator who has the power to grant or deny access to the users of the blockchain. This provides greater anonymity to the blockchain and allows for faster transactions, while keeping operating costs low. Remarkably, many private blockchain models are straying away from the originally principles that blockchain was built on, specifically, the theoretical possibility of tampering or revisions by the operator. The reality of energy applications for blockchain is that there are indeed first applications for the technology, but that the majority of cases are still in the early stages of development. Blockchain experts are aware of the lack of clarity on where the value of the technology actually lies and what the implementation will look like in the energy sector. Nevertheless, experts have seen that since July this year there have been more than one hundred cases of blockchain technology applications by energy companies. They are expecting more cases to follow in the coming months as the scalability of the technology advances. The current global situation sees a mixture of established companies that are aware of the benefits of their stability and experience; and startups that have more freedom to experiment with developing completely new models. There is a discrepancy between the focus of the experimentation of startups, who mainly tend to address very disruptive business models like Peer-to-Peer microgrids, and the more step-by-step approach of utilities, who use blockchain technologies to tackle currently existing problems like grid congestion due to variable power supply by renewables. An example of such new models is “Smart Agent”, which is being developed by Grid+ with the purpose of programmatically buying and selling electricity on behalf of the user. These can be private households, prosumers, or single assets such as wind turbines. This could lead to the agent analyzing its owner’s future energy consumption and production in order to use this information to position itself in the best place possible when it comes to grid negotiations. Another example is the blockchain systems company Electron and their plan to facilitate faster switching processes by offering a shared registration platform for all electricity and gas supply points in the UK. This type of platform is expected to also be used for new types of assets. With all of these blockchain applications, different big players are opting to come together to develop pilot projects. In order to keep up with the growing volume of renewable energy, TenneT, a leading European electricity Transmission System Operator, has teamed up with Vandebron, a renewable energy company, and IBM, the current leader in open-source blockchain technologies, to help prepare its electricity system for the future demand. TenneT wants to balance its grid by putting Vandebron in charge of working with customers who own an electric vehicle to make the capacity of their car batteries available to balance the grid without compromising the availability of the car batteries. IBM’s task is to develop a blockchain platform that would ensure the verifiability and transparency of the transactions of the small-scale batteries and electric cars. By doing so, customers are able to make their energy flexibility available to the market, while TenneT gains insights into the possibility of activating flexibility in the energy system. As the technology advances, Peer-to-Peer energy trading together with Smart Agents could lead to Machine-to-Machine energy trading. One of the benefits of blockchain technology is that it reduces the transaction costs for energy transactions, making transactions between smaller energy users and producers more interesting from an economical perspective. The next level would be to include fully automated agents into a blockchain-driven grid in order for the machines to make transactions among themselves without human intervention, hence the name Machine-to-Machine trading. According to the World Economic Forum, the total global value of assets being administered using blockchain technology grew between 2013 and 2016 by approximately 1.600%, with an additional $1.4 billion invested in the first 9 months of 2016. Experts use these statistics to calculate the potential of blockchain technology, but the majority of them do agree that mainstream adoption of the technology might take 5 to 10 years. Only time will tell if blockchain technology can mature in a way that it is adoptable in other countries around the world, but one thing is for sure, the technology and its applications are growing at an unprecedented rate.